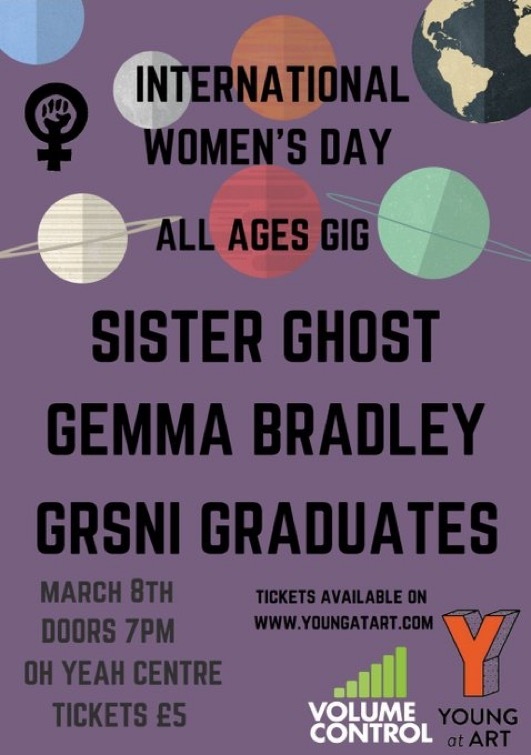 The next gig will take place on Friday 8th of March 2019 in The Oh Yeah Centre, Belfast (doors at 7pm) – we are celebrating International Women’s Day 2019 with an exciting lineup reflecting the diverse and powerful females lighting up our live music scene. First up is Gemma Bradley; Gemma takes inspiration from her mother’s record collection, including the iconic vocal prowess of Amy Winehouse, the distinguished rhythms of Bob Marley and the avant-garde creativity of Izzy Bizu, Gemma has created her own distinctive style of sweet and delicious authentic, Contemporary R&B Pop music. Next up is Sister Ghost; Sister Ghost, aka Shannon O’Neill, has a background playing in bands from the age of 12, playing noisy, spectral art-rock with a pop heart. In late 2013, she saw an opportunity to do things her way for the first time. She began writing and demoing – singing and playing everything herself – before enlisting a band to bring Sister Ghost to completion. The bill is topped off by the Girls Rock School NI graduates; Founded in 2016 GRSNI have been encouraging and empowering women and girls of all ages to riff, rock and roll! Workshops and mentoring in electric guitar, bass, drums and vocals. Tickets are available at the door for the very reasonable price of £5 or can also be purchased online at www.eventbrite.co.uk. Competitions and further details surrounding the gig will be shared in the coming weeks through Volume Control’s social media platforms on Twitter, Facebook and Instagram.